With Google Structured Data you can create the relevant Rating Structured Data for each Content Item that supports them. By default it is set to 0 to avoid generating Structured which do not reflect your current content. Take a look at how to use them. Point 1 Use the "Custom" Option if you want to manually add the rating data. Point 2 You can select any value between 0 and 5 by dragging your mouse through the stars. Point 3 Type the total number of ratings which are apparent through your website. It is important to know that Google performs automatic and manual checks on the relevancy of your Structured Data. 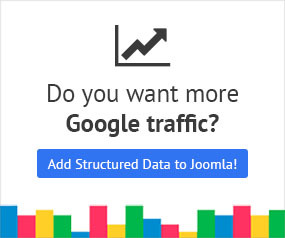 This means that you should not be generating Structured Data that are not clearly displayed through your website. If you want to use the Rating option for your content and for whatever reason you do not have it available through your website, for example, you have testimonials sent to you to your email or personally. You can create the HTML for each testimonial/review yourself to resemble reality the best way possible. Google Structured Data v3 has an Inherit option which collects all the ratings which have been stored by the component integration which is in use at each time. At the end, your main concern is to prove to Google that your claims are true by displaying them through your website one way or another.